Understanding forest regrowth is crucial to predicting and mitigating environmental damage, and with over half of the word’s tropical forests currently recovering from human land use, insight into forest regrowth mechanisms is more important than ever. To accurately model and fully leverage the potential of regrowing forests to act as carbon sinks for climate-changing atmospheric carbon dioxide, we must comprehend the mechanisms that augment and limit the growth rates of these recovering forests. Trees need a variety of resources to grow, and their growth is limited by the scarcest of these resources. Often, this limiting resource is nitrogen. Nitrogen becomes available to plants when nitrogen-fixing bacteria on a host plant’s roots convert nitrogen in the air into a plant-usable form available to both the host (called a nitrogen-fixing plant) and its neighbors. This has led many researchers who study forest regrowth to posit that more nitrogen-fixing trees leads to more overall forest growth. However, a team of researchers from Columbia University, the University of Connecticut, and Rice University recently called this conclusion into question. They found that in moist Costa Rican tropical forests, areas with more nitrogen-fixing trees actually had a lower growth rate than did those with fewer nitrogen-fixing trees. The results of this study call for a reevaluation of the influence of nitrogen fixers on the forest around them. In order to test whether nitrogen fixers augmented forest growth, the researchers searched for connections between the presence of nitrogen-fixing trees and growth of surrounding trees. In one-hectare plot areas, they compared the number of nitrogen-fixing trees with both annual tree growth and the growth of the fixer’s neighboring trees. Surprisingly, in both cases, the researchers observed a negative trend that suggested that more nitrogen fixers lead to slower forest growth. The researchers proposed several possible explanations for these unexpected results. While nitrogen-fixing trees provide usable nitrogen to the trees around them, they may crowd out their non-fixing neighbors. Fixing-trees have high growth and survival rates, as well as high nutrient demands. Their resource consumption and the shade they produce may inhibit neighboring trees from growing. Additionally, nitrogen may not be the limiting factor in the growth of these neighboring trees—in fact, the limiting resource may be something that the presence of nitrogen-fixing trees is making even scarcer. The results from this research run counter to several similar studies. 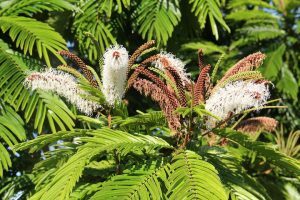 Two studies on regenerating moist tropical forests in Brazil and Panama found that the number of nitrogen-fixing trees was positively correlated with total biomass accumulation. Why do the results conflict? A difference in the ages of forests and genera of trees may contribute to the disparity, but the researchers believe that the disparity is more likely due to differences in baseline soil nutrient availability between the sites analyzed in the studies. Benton Taylor, PhD student at Columbia University and first author of the paper, highlighted the implications of the study for Earth systems modelers and their assumptions on the effect of nitrogen-fixing trees on growth and atmospheric carbon dioxide levels. “If modelers assume that places with high nitrogen-fixer abundances will have high nitrogen inputs and, thus, have high rates of growth and carbon sequestration, the results of their models may be misleading,” Taylor said. He further noted that, although several pieces of evidence suggest that the study’s results may be typical, the questions of when and through what ecological factors nitrogen fixers have an effect on forest growth remain unanswered. These are the questions Taylor plans to pursue. Forest regrowth is having and will continue to have a pivotal effect on the world’s climate. Climate predictions and climate mitigation both hinge on a better understanding of forest regrowth and the mechanisms through which it may be augmented. The now-prevalent regrowth of tropical forests ought to serve as a focus for curbing climate change—but it’s clear that fixing nitrogen won’t necessarily fix everything.